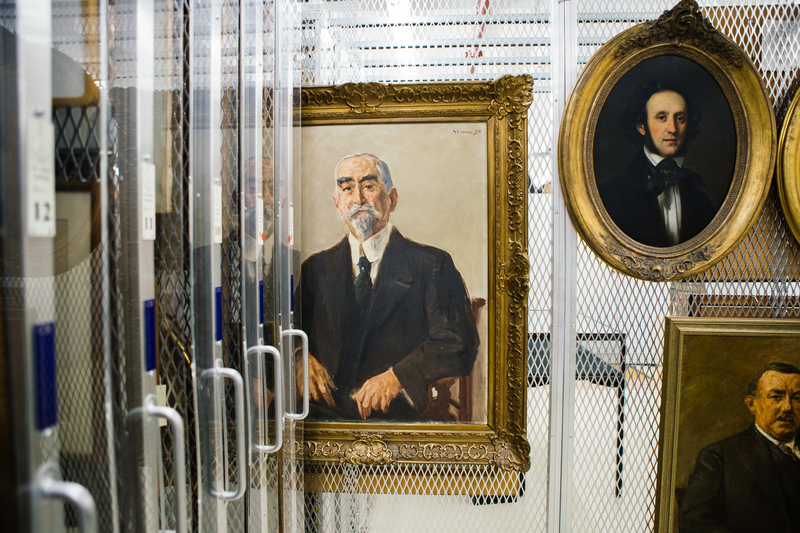 Works by Eduard Magnes, Max Liebermann , and other artists in the LBI’s art storage facility at the Center for Jewish History in New York. By Jon Pack. Search the catalog at old.lbi.org/artcatalog. Thanks to a gift from a trust under the will of the late Edythe Griffinger, LBI has launched a new project that highlights its Art and Objects collection. The grant funded not only the development of a new online portal for digitized artworks, it also supported the work of curators and librarians who selected the most important works and improved the metadata in the catalog to facilitate discovery of works that have rarely been on public display. Executive Director William Weitzer said that cataloguing and digitizing these types of items will help not only students and scholars, but also professionals such as museum curators, documentary filmmakers, and educational publishers find and use the items. “By making our collection more accessible to a broad range of individuals and groups, our art and artifacts will be better utilized and the mission of LBI better known,” said Weitzer. Nearly 1,000 items are now available at old.lbi.org/artcatalog, and staff is working to add more of the nearly 8,000 items in the art collection. For a comprehensive search of all digitized material in the LBI art, archival, and library collections, please consult DigiBaeck at lbi.org/digibaeck. To search all LBI holdings, including the many published works in our library collection that have not been digitized, search the shared catalog of the Center for Jewish History at search.cjh.org.